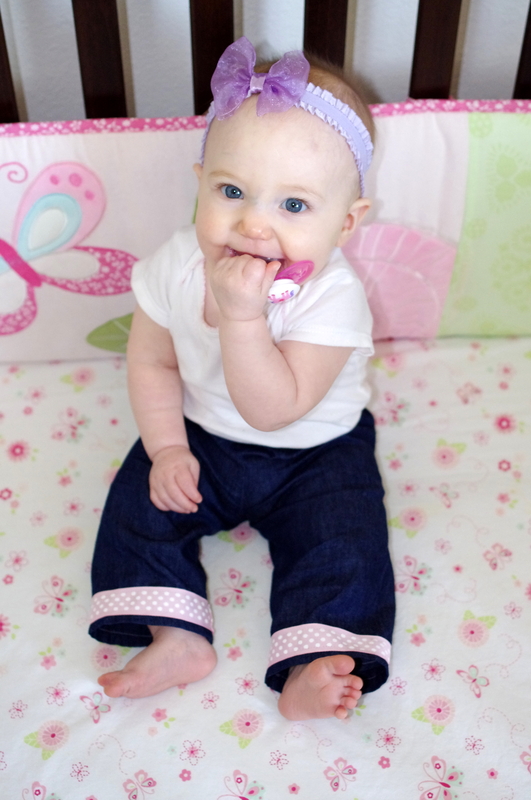 I’ve been wanting to make Hannah some baby jeans for quite a while. Because it was my first time, I wanted to keep it basic. Just a simple pair of pants with an elastic waistband. They turned out a little too simple looking, though, so I decided to dig into my mini ribbon stash to add some embellishment to the cuffs. The pink with white polka dots ribbon I got from Joann’s. It was originally intended for another project that I lost interest in and never started. The blue and green ribbon was a thrift store find. I’ve never been big on thrift stores, but recently I’ve changed my tune. When I was visiting my in-laws in Arizona over the Christmas holiday, I went with my mother-in-law to this little thrift store called Hidden Treasures. They have so many awesome things for amazing prices. This cut of ribbon, a few yards or so, was only 50 cents! 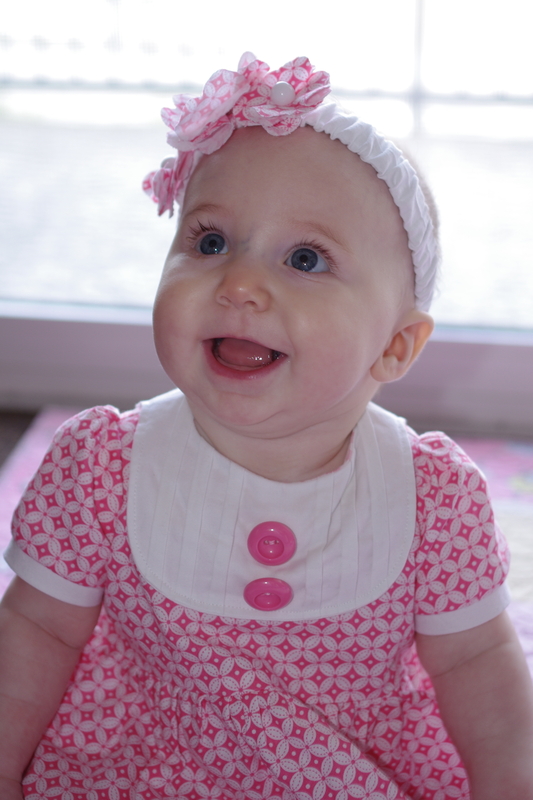 I also scored some other really cute clothes for Hannah. Perhaps my biggest find of all, a pair of seemingly brand new Gap jeans for $1! 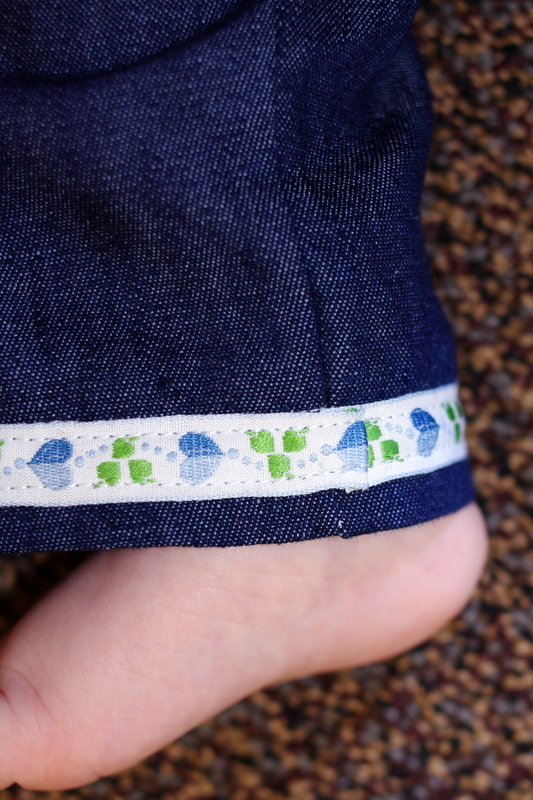 So now that I’ve drifted totally off topic…Basically, ribbon bottom jeans are a cinch. Pants sew up pretty quick, especially when you cheat like I did by making each pant leg one piece of fabric so there is no outside leg seam. Once the pants were all sewed together and the legs were hemmed, I simply pinned my ribbon around the cuffs, leaving a little bit of extra ribbon on the end where I would finish the seam. Just before I got to the point where the ribbon ends met, I tucked the extra bit of ribbon under and layered that over the raw edge of the ribbon that I had already sewed down at the start of my seam. I hope that’s not too confusing! (See pic below) I should have lined the ribbon seam up with the leg seam, but this was my first attempt. I did with the other pair of jeans. 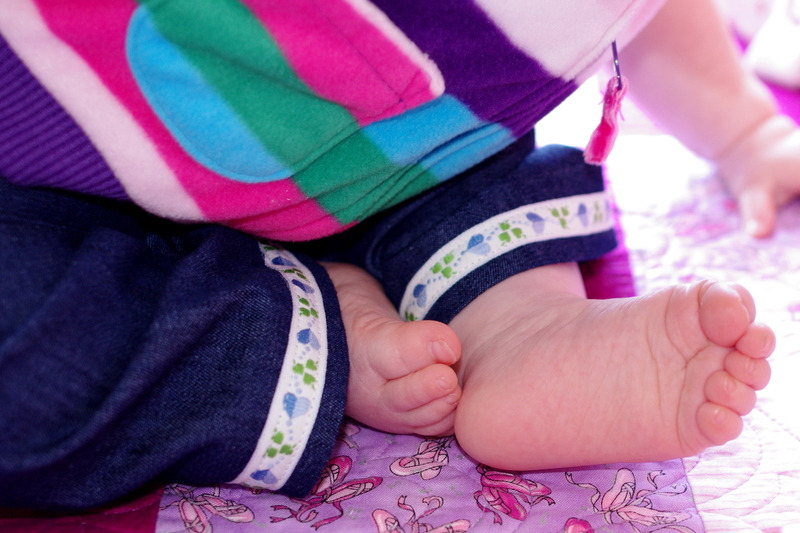 I was thinking this would be an easy way to embellish store bought jeans–for baby or mommy–for an even easier project. About a week and a half ago I got an amazing package in the mail from my husband’s Aunt Pam. She told me that a package was coming and I thought she was probably sending a small gift for the little one. 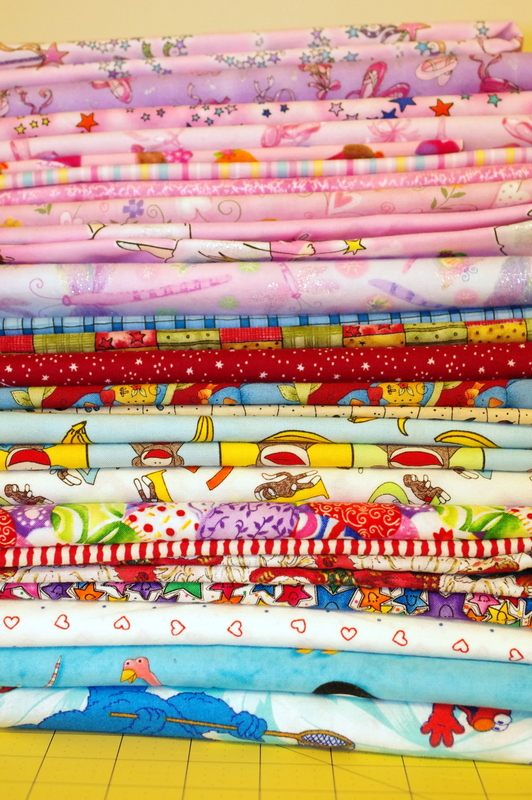 It ended up being a huge stash of fabric! 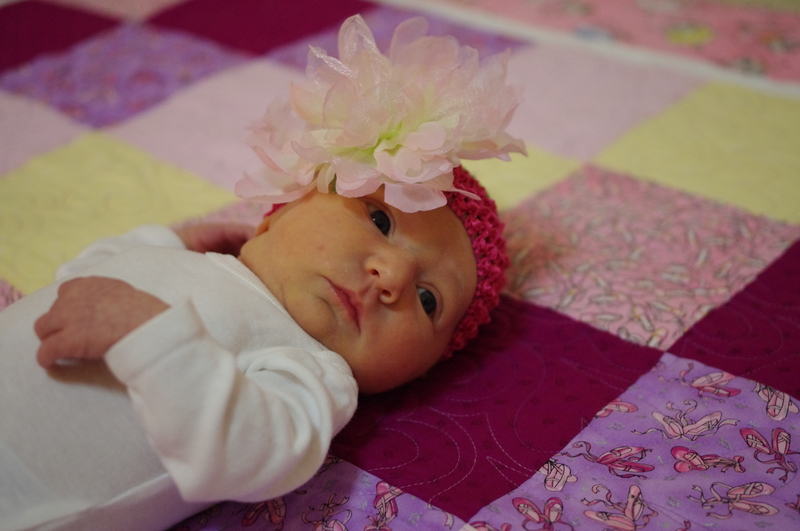 Aunt Pam is a quilting extraordinaire and made the most beautiful quilt for my sweet girl when she was first born. 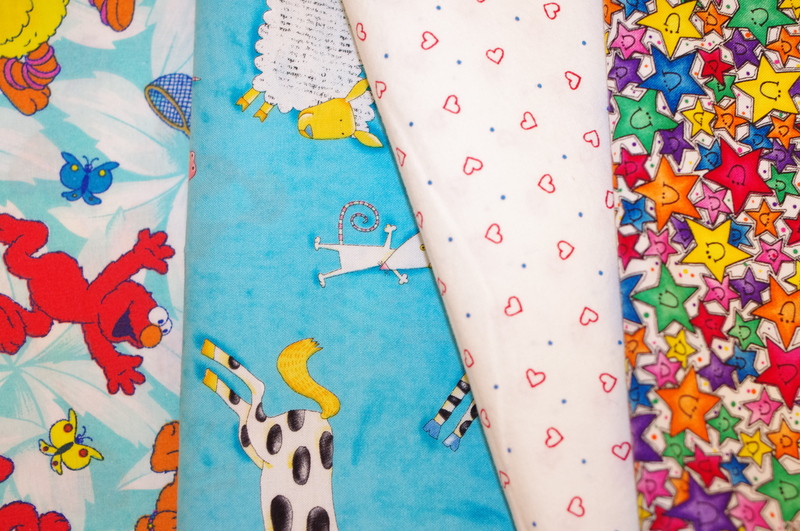 Many of the pictures I have taken for the blog have this quilt in the background somewhere. We definitely use it a lot and will always cherish it as a special gift. This is the little one with her quilt right after we received it in the mail. 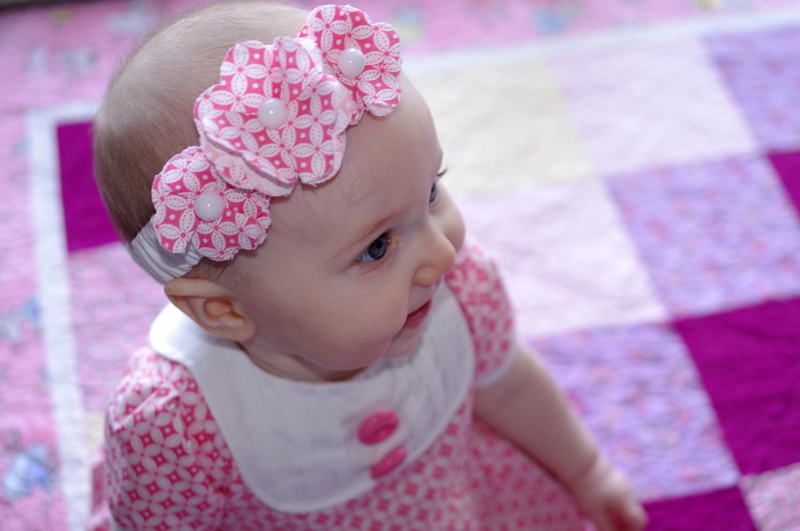 Adorable, both baby and quilt! 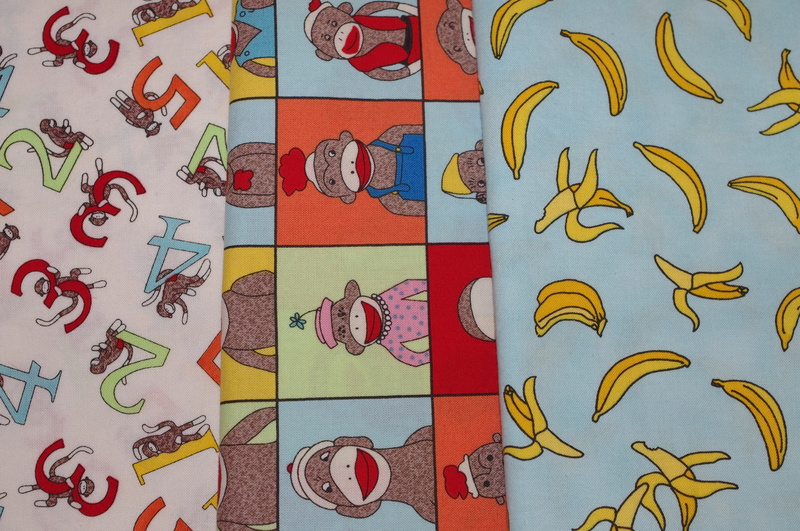 Most of the fabric that Aunt Pam sent seems like it is more for projects other than clothes, which is actually really great because I’ve been wanting to try my hand at some things other than skirts, dresses, and headbands. I really want to make a quilt at some point. 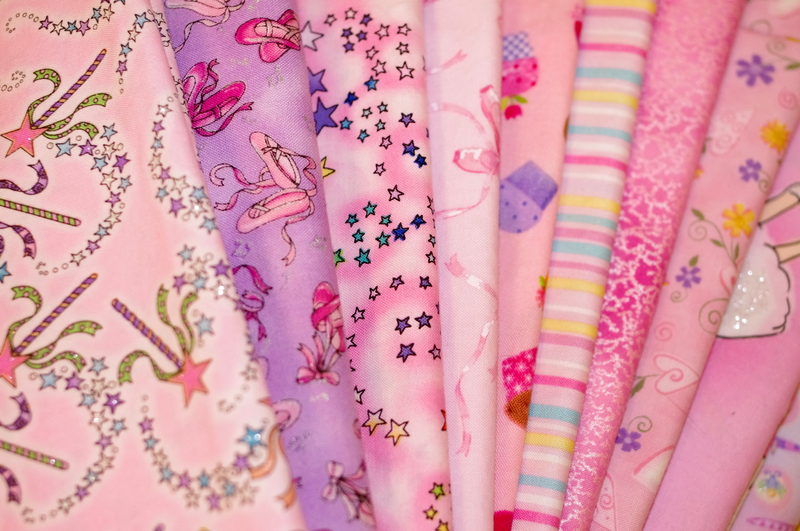 Maybe I can start out with a little dolly quilt when she gets her first doll. I’m not sure when that will be but I hope sometime soon! I have a few other ideas in the works too. Stay tuned! 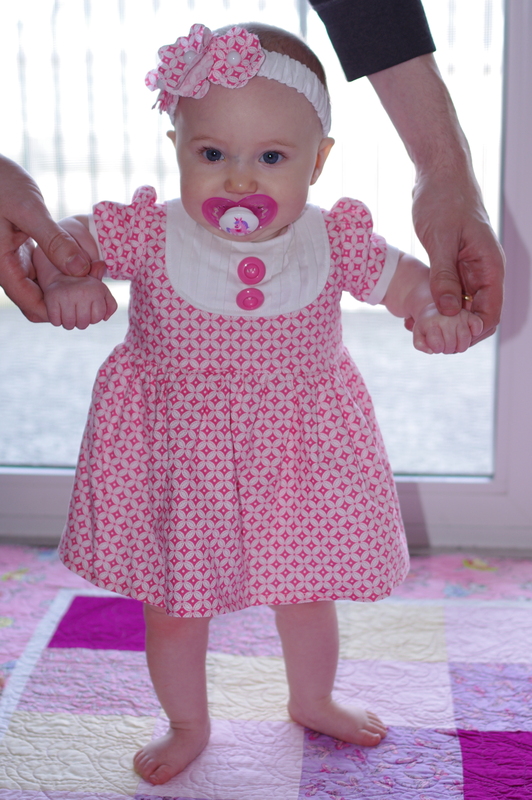 Another holiday, another excuse to make a dress for my sweet girl. I’ve been wanting to make a peasant dress for some time. 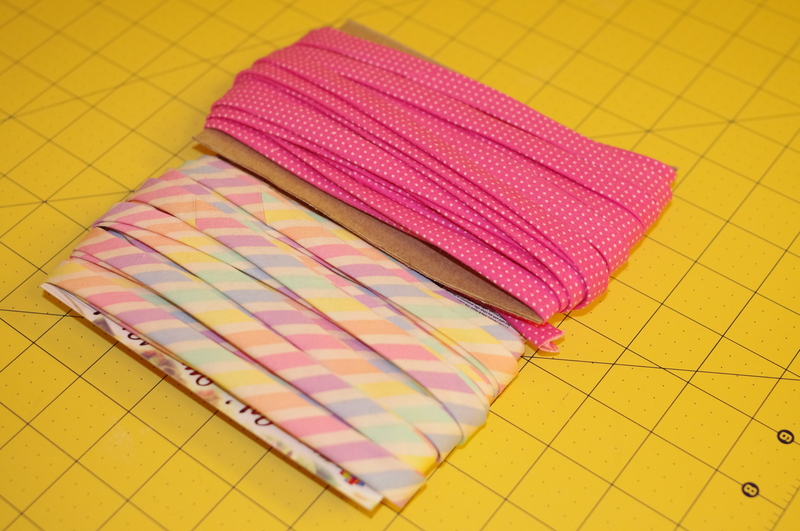 It’s one of those staple projects that everybody has to make at some point and everybody adds their own little twist. I used the free 6-12 month peasant top pattern from makeyourownbabystuff.com. To make it into a dress, I simply added some length to the pattern. 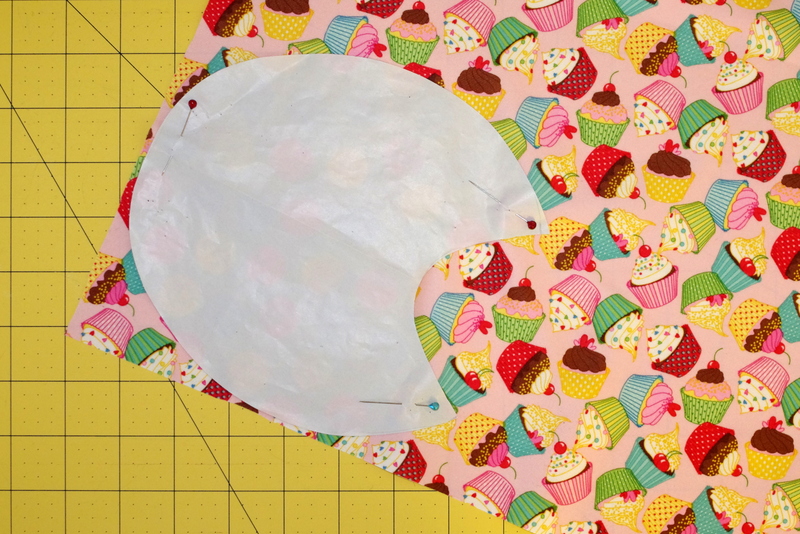 I thought that I would need to make the pattern angle out in order to turn it into a dress, but that wasn’t the case. Since the elastic gathers the top, there is more than enough fabric for a flowy dress without having to alter the shape of the pattern. Because the fabric I used for this dress was pretty busy, I wanted to add some embellishments but I wasn’t really sure what would look good. I decided on a solid pink accent fabric to make a ruffled bottom and some fabric flowers. At first I wasn’t too sure about the ruffled bottom. It looks more like irregular pleats, but I like it more every time I look at it. The fabric flowers were really simple to make. I’ve made a couple different kinds of fabric and felt flowers but wanted to try something new. I used an idea from pinterest (which I am now obsessed with!) from the blog the fickle pickle. 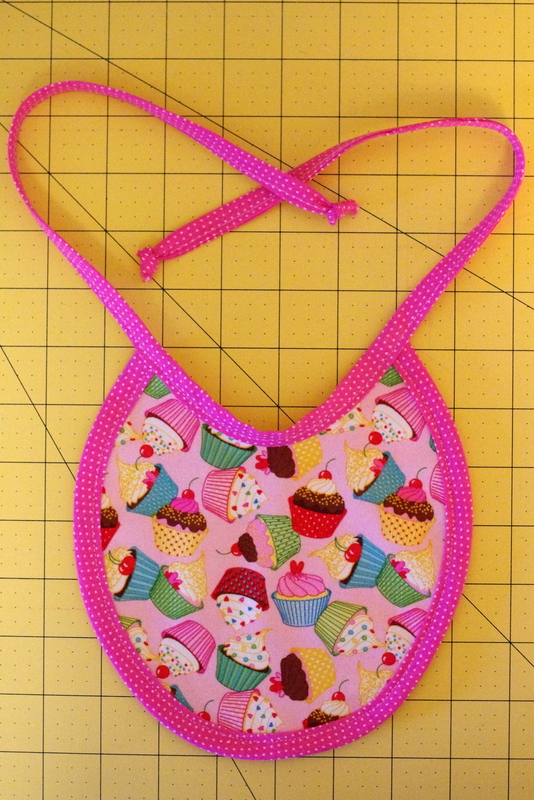 The tutorial calls for felt but I decided to use my pink accent fabric instead. A little different result but the same basic concept. I love the green buttons. It was a nice way to use a color I don’t normally use and it pulls out the green hearts on the dress. I wish that I would have made the dress a little shorter but the extra length will make it wearable for longer. Since hearts are cute year round and she’ll wear it on many more occasions, I didn’t feel the need to shorten the dress and resew the ruffle. A cute, fun, and easy dress. 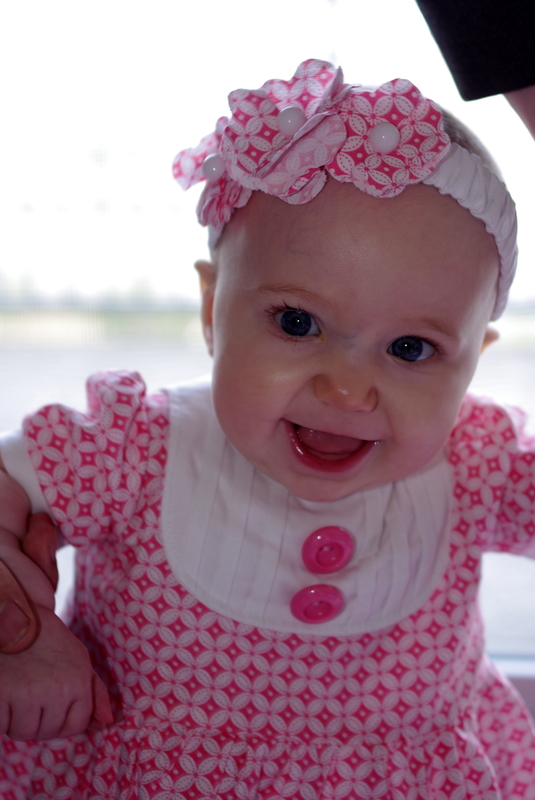 Happy first Valentine’s Day to my little sweetheart. This is my very first tutorial! I suppose it’s best to start off with something simple and it doesn’t get much easier than a felt garland. 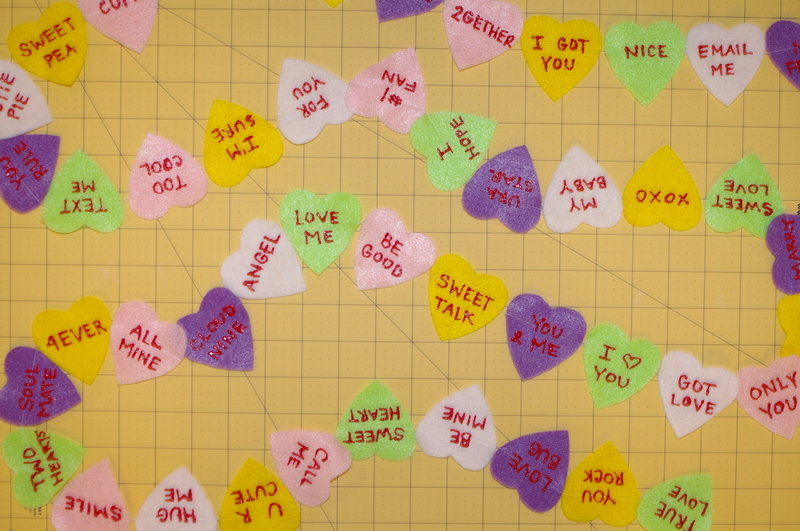 Conversation hearts are such a fun part of Valentine’s Day, so I thought, why not turn them into a felt garland. What a fun and easy way to get into the Valentine’s Day spirit. Once you know how long your garland should be (with extra length for draping! ), create your stencil. 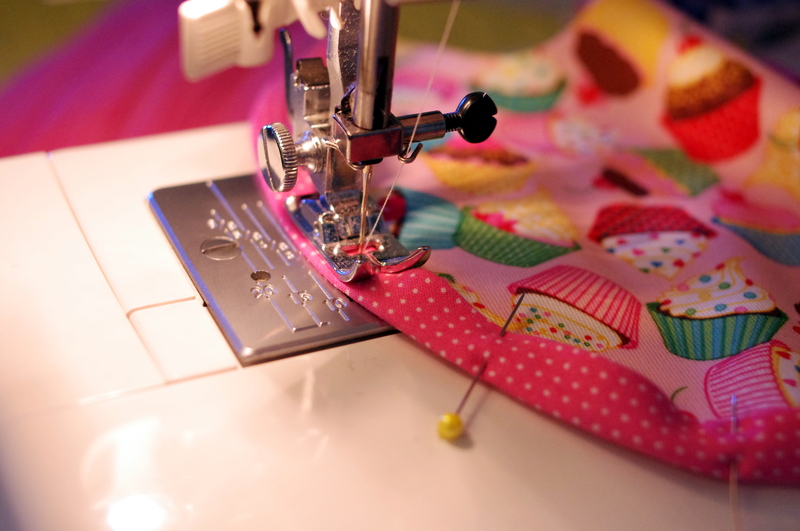 I find that shapes that are about one inch x one inch work best for most felt garlands. 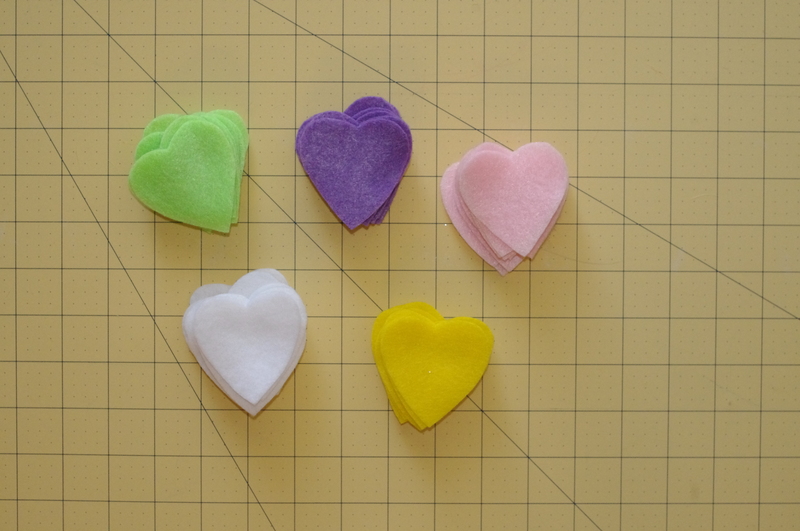 This also makes it easy to figure out how many hearts you will need to make your felt garland the right length. To create my stencil, I used a clip art image from Microsoft Word and sized it to approximately one inch x one inch. 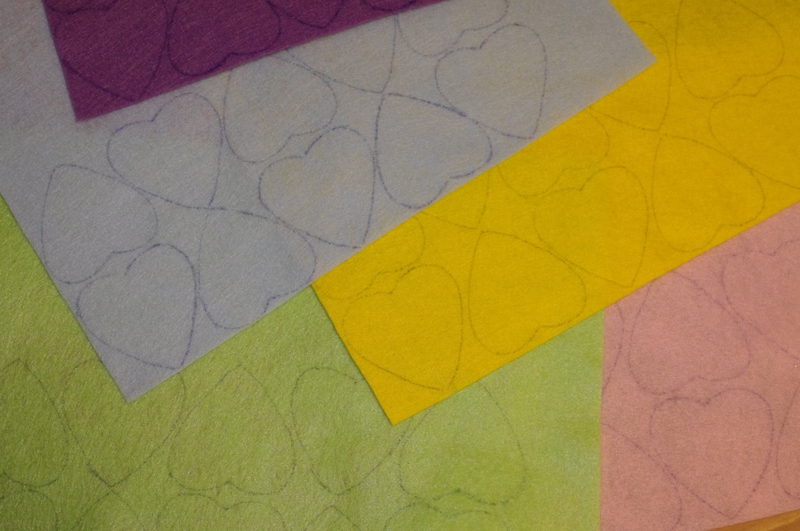 Trace your heart stencil onto your felt blocks. 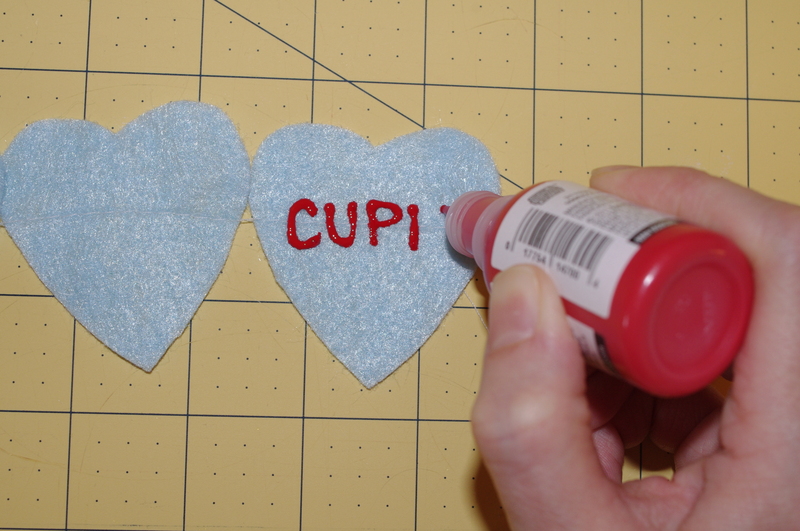 If your heart stencil is one inch x one inch, divide the length in inches of your felt garland by 5 (the number of colors) to find the number of hearts to trace onto each felt block. Then cut out your shapes, keeping them separated by color. Now it’s time to sew! Since I didn’t want to make a color pattern, I grabbed randomly from each of the color piles to until I had a new pile of hearts in random order. The only thing I avoided was putting two of the same color next to each other. 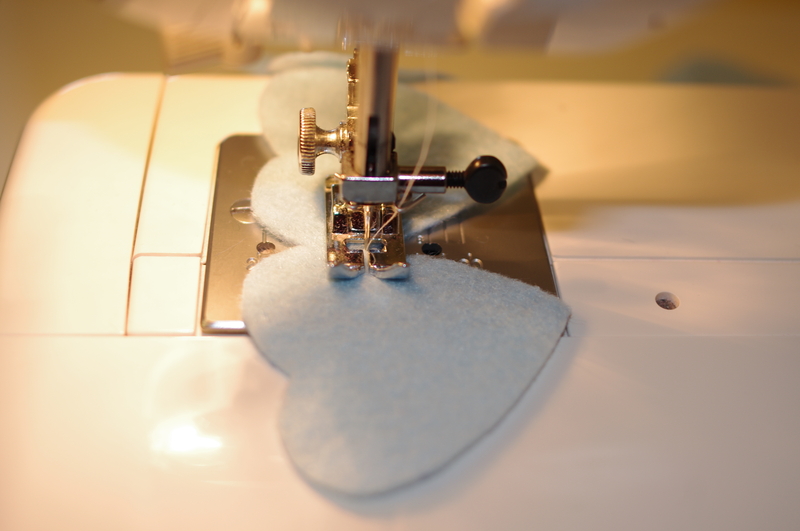 To sew, you simply place one heart after another under the presser foot, sewing the length of each heart until you have no more hearts. 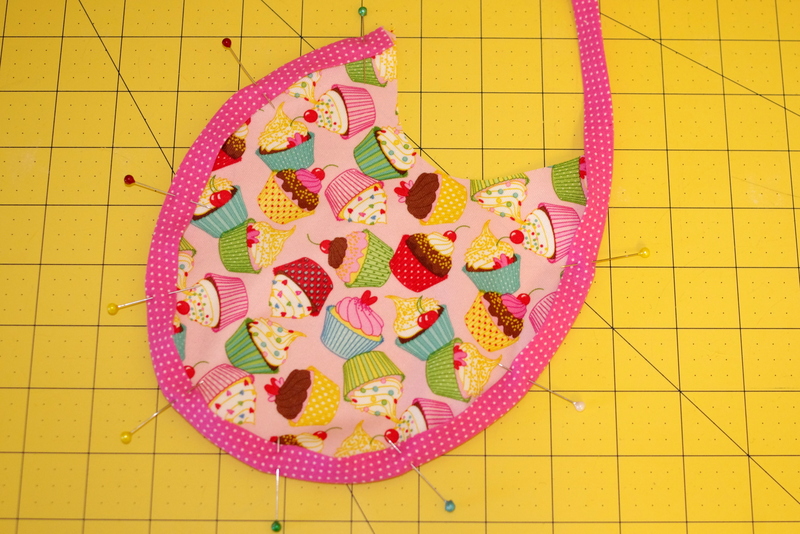 Remember to backstitch on the first and last heart. 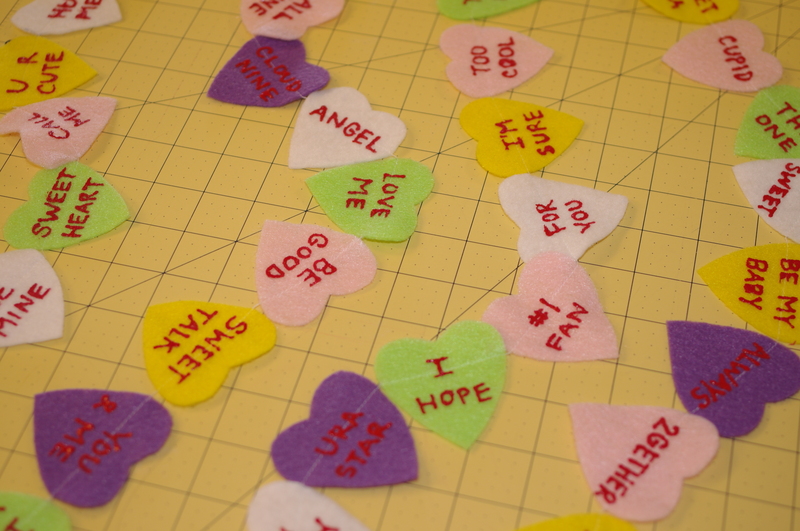 And voila, you have a felt heart garland. Lay out your garland on a long, flat surface so that your hearts are all facing in the right direction. Now it’s time to add the fun sayings. I looked up conversation hearts on google image search for ideas. Use your fabric paint to carefully write out your witty sayings. Make sure not to put the tip of your paint directly onto the felt. I found that when I did that, sometimes it would sort of catch on the felt fibers and was kind of a pain, so make sure you apply the paint just above the surface without touching the felt fibers. Let it dry for a little while. It actually doesn’t take too long. 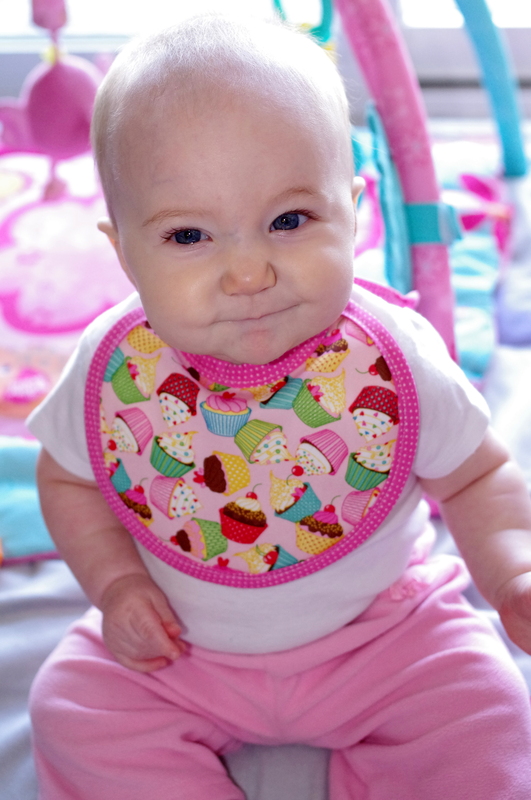 Then, admire your adorable conversation hearts felt garland! 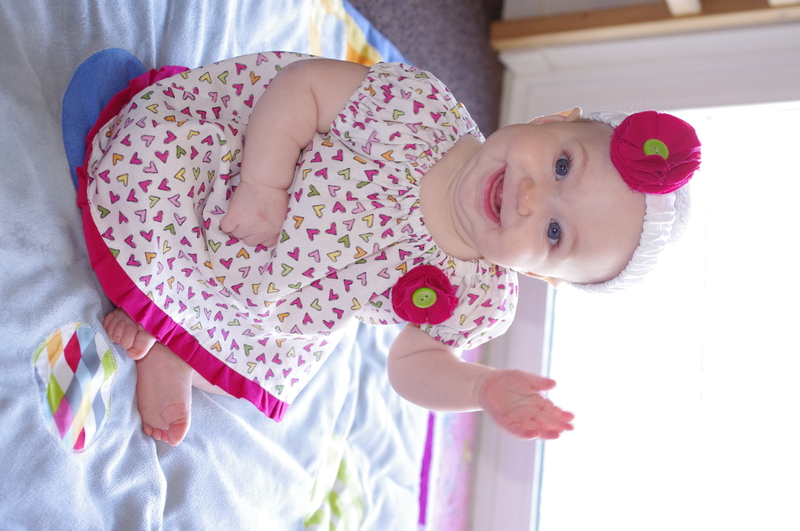 Jess at Craftiness Is Not Optional strikes again with another adorable dress tutorial. I can’t get enough of that blog! I just couldn’t resist and had to make one for my cutie pie. I’ve had this fabric for quite some time. 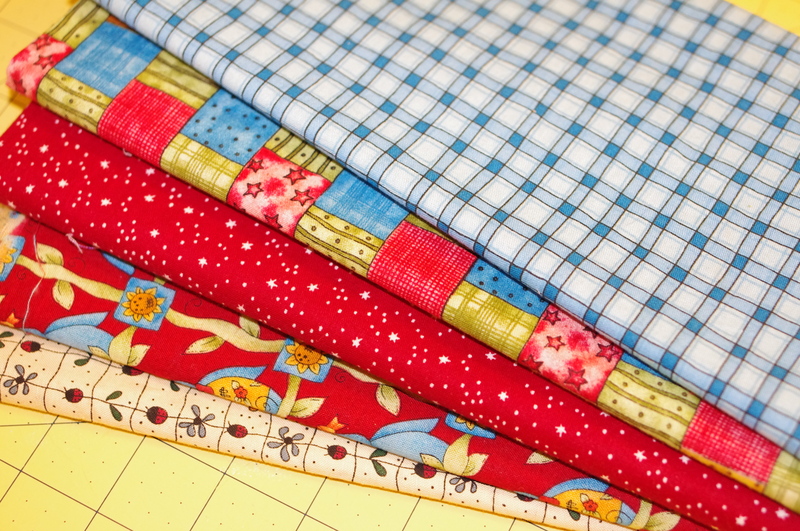 It was one of the first cuts of fabric I bought when I started this whole sewing mania. 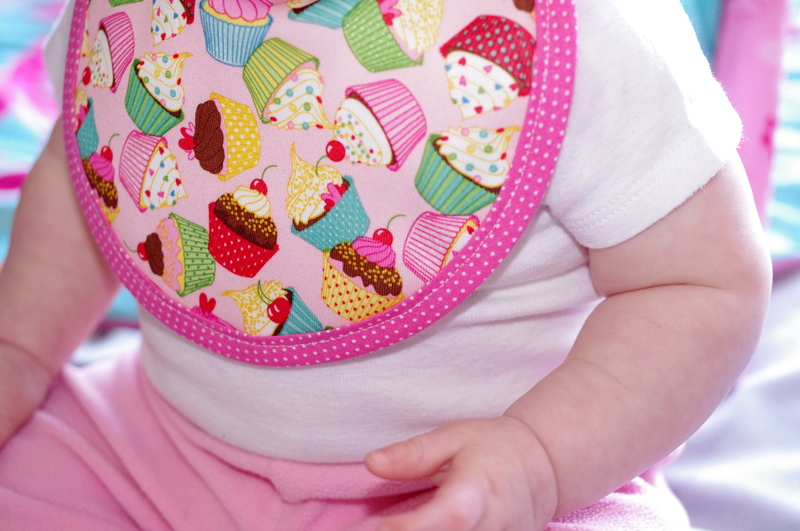 Even though I love it–I’m sort of addicted to all things pink since having a little girl–I just didn’t have a project in mind that seemed suited for it. 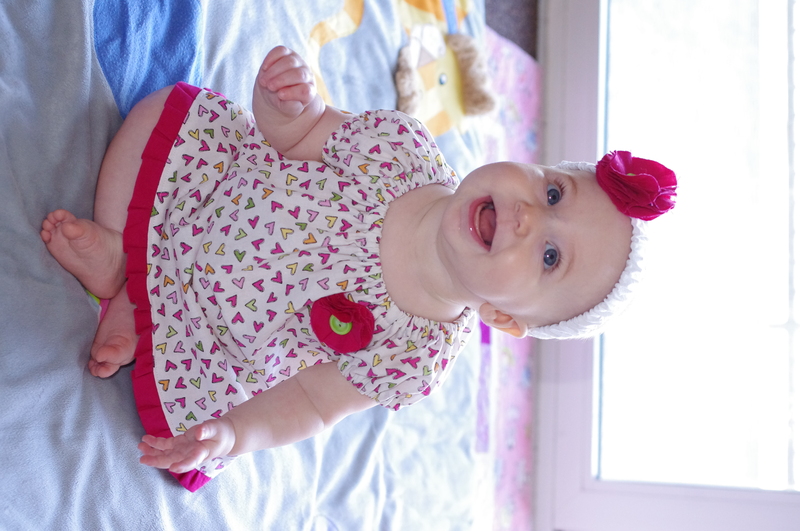 I’m glad that I waited for this adorable dress to come along, because I think it was perfect for this project. By the way, I love the buttons too. I pretty much love everything about this dress. Again, what a great tutorial. Almost every time I complete another project, I walk away with new skills. One thing I learned this go round was how to make pleats. I think they turned out pretty well. I’ve been thinking that I want to start creating some of my own designs/patterns and I think pleats will make an appearance. I do have to admit, they were sort of a pain in the you know what, though. You definitely have to be precise for them to look good, and since I was kind of winging it, I had to rip a few seams and remeasure to get them right. A skill I revisited was inserting an invisible zipper. I think there’s definitely a reason it’s been a long time since my first attempt. An exercise in patience for sure. I’m thinking it might be the sort of thing best learned from someone who knows how to do it rather than attempting it by trying to follow a blog tutorial. On the outside I think it looks pretty good, but I have to admit, A LOT of time was invested in sewing, ripping seams, and resewing to get it to look this way. It’s a good thing that the seams are hidden on the inside! 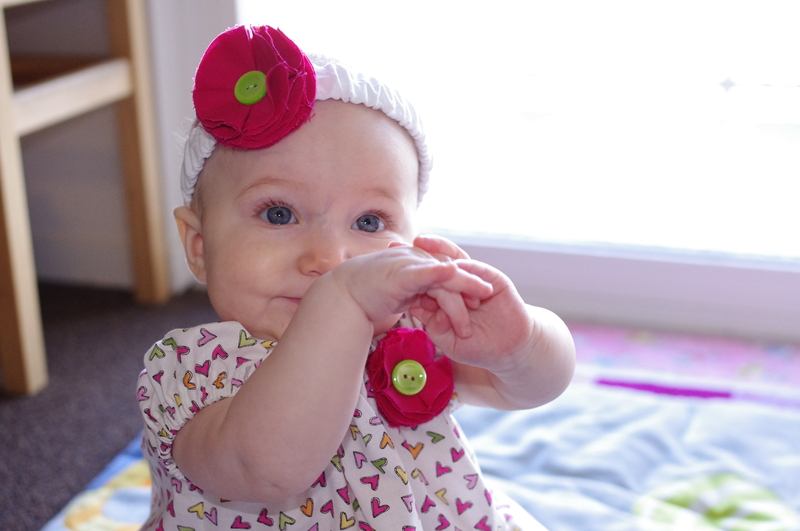 And of course, a matching headband! I was originally going to sew a thin strip of white around the waist but after cutting, sewing, and turning the fabric strip, I changed my mind. Luckily my efforts didn’t go to waste. The strip of fabric became the headband. I was going back and forth between a bow and a flower, but as you can see, I went with three flowers. 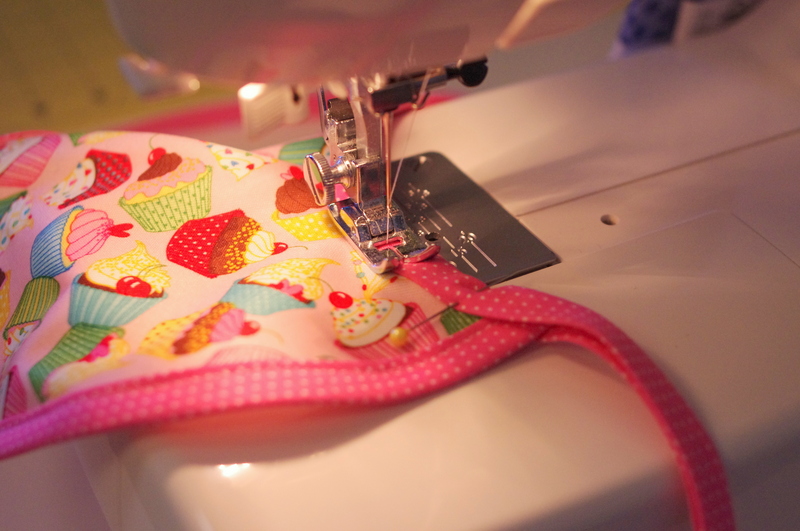 Such a great way to use up fabric scraps! A challenging project but definitely well worth the time and effort for my sweet little girl.